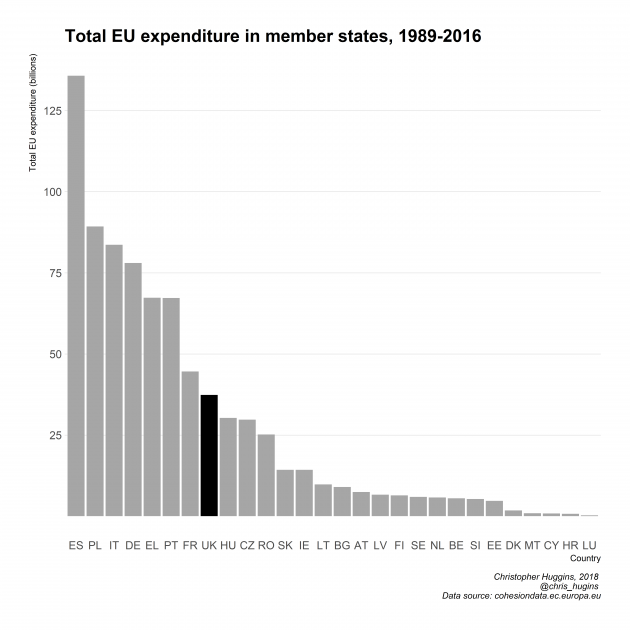 The EU’s cohesion policy is 30 years old and now accounts for around a third of the EU’s budget. To celebrate, the European Commission has published a new dataset. This details annual payments to the EU’s regions since 1989. The dataset covers most funds under the European Structural and Investment Funds umbrella. For the UK this covers the European Regional Development Fund (ERDF), the European Social Fund (ESF) and the European Agricultural Fund for Rural Development (EAFRD). This means some big areas of EU spending (such as payments made via the Common Agricultural Policy) aren’t included. The dataset also doesn’t include the territorial co-operation element of ERDF, such as Interreg. This aside, it provides some interesting insights into how the EU has invested in the UK since 1989. Between 1989 and 2016 the UK received a total of €37.4 billion from the three funds. There’s sometimes a popular assumption that the lion share of EU regional spending has been focused on central and eastern Europe, but over the long term the UK has done relatively well. 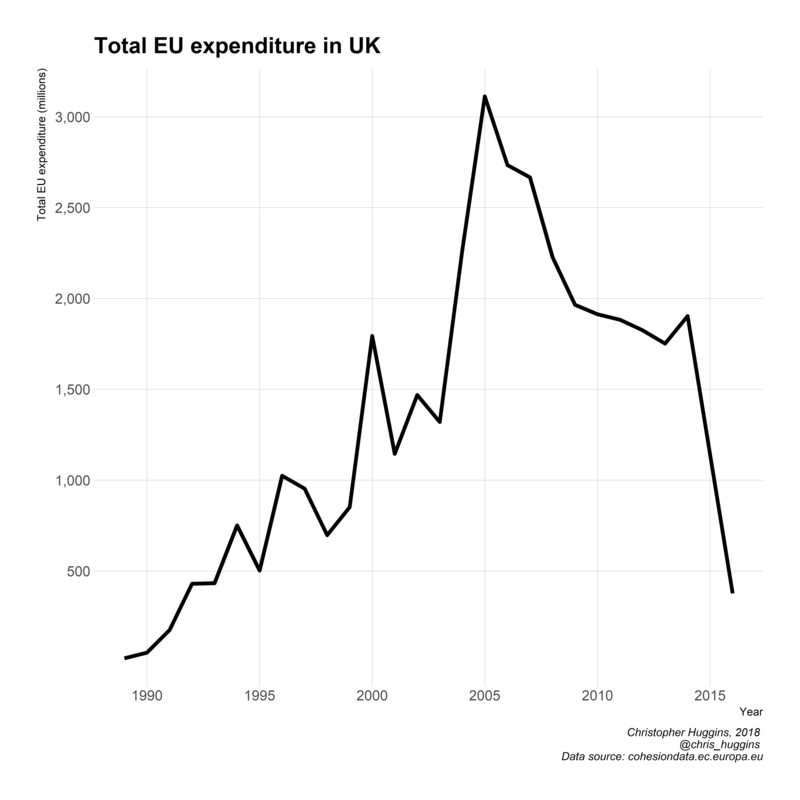 The amount spent in the UK since 1989 is well above the EU-28 average of €28 billion. This partly reflects that the UK has been a member state for a long time and so has been able to benefit from EU funds over a longer period. But it’s also important to remember that the UK pushed hard for EU regional policy to be adopted in the first place, mainly because many of its deindustrialising regions would be key beneficiaries. The UK benefited most from the 2000-2007 programming period, which saw €16 billion worth of investment. Spending reached a peak in 2005. It then fell from the 2007-2013 programming period as funding shifted its focus to central and eastern Europe. In terms of where EU money has been spent in the UK, West Wales and the Valleys have benefited the most. Merseyside, Northern Ireland, South West Scotland, South Yorkshire and the West Midlands have also seen high levels of investment. 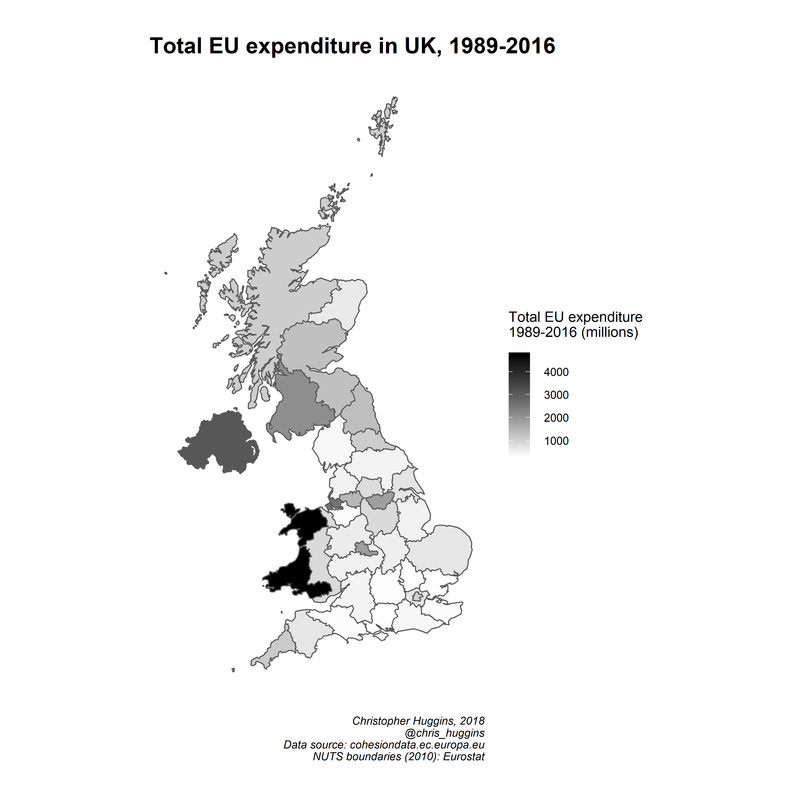 But something worth noting is that every area in the UK has benefited to some extent – EU investment has not just been the preserve of areas in industrial decline. In the context of Brexit all of this leads to an obvious question: what will happen to this investment after the UK leaves the EU? The amounts spent are not insignificant. As austerity bites, localities have also become increasingly reliant on EU funding schemes to deliver projects. During the 2017 general election the Conservative Party manifesto committed to establishing a “Shared Prosperity Fund” which would replace EU regional investment after Brexit. But there’s been little progress and clarity on this since the election. While the EU is preparing its proposals for the next cohesion policy programme from 2021, the UK has only got as far as guaranteeing to underwrite EU projects up to the end of 2020. For this reason, UK local authorities – the primary beneficiaries of EU regional funding – are starting to worry. There are plenty of debates about how effective EU regional spending has been. But overall UK regions have seen sizeable investment from the EU, which the LGA says has been used to “create jobs, support small and medium enterprises, deliver skills training, invest in critical transport and digital infrastructure and boost inclusive growth”. The extent to which this support will continue after Brexit remains uncertain. Brexit boost? Did the EU referendum improve the awareness of EU regional policy in the UK? Published on 27 July 2017 by Christopher Huggins | Comments Off on Brexit boost? Did the EU referendum improve the awareness of EU regional policy in the UK? I am a Research Fellow at the University of the West of Scotland and Teaching Fellow in European Politics at Keele University. I am currently working on Brexit's impact on UK fisheries policy, but I'm also interested in the interaction between local government and the EU. This blog is an outlet for my research, thoughts on local government in the EU and my experiences as an early career academic.